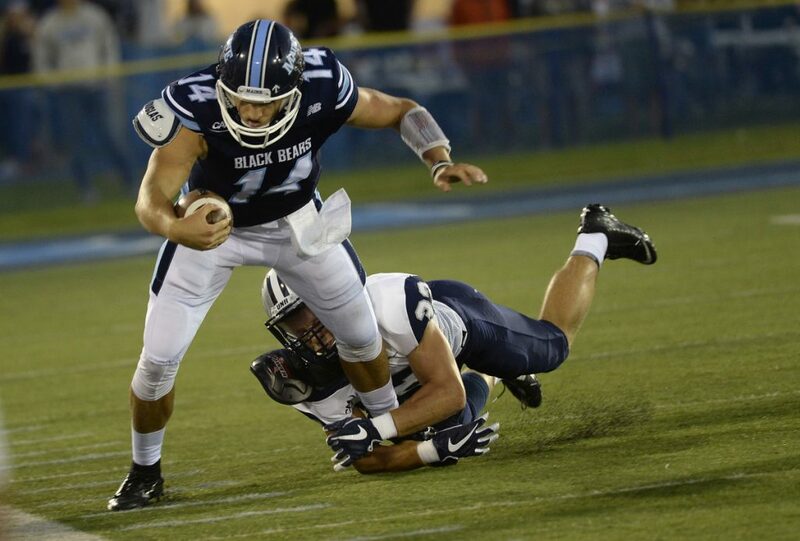 Sophomore Chris Ferguson injured his throwing shoulder in last week's win at Richmond, but says he's 'feeling good' as the Black Bears play for the CAA title on Saturday. Chris Ferguson is expected to be at quarterback Saturday when the University of Maine takes on Elon with a chance to clinch the Colonial Athletic Association championship. The sophomore suffered a right shoulder injury during the third quarter of last weekend’s game at Richmond – the second time this season that he injured his throwing shoulder. But unlike the first time, when Ferguson missed the next two starts, he shouldn’t miss any time. He practiced both Tuesday and Wednesday. Ferguson originally injured his shoulder in the first quarter of the Sept. 22 game at Central Michigan. He missed the rest of that game and the next two, against Yale and Villanova. Maine went 1-2 without him. Ferguson threw for four touchdowns before being injured on a sack during Maine’s 28-9 win over Richmond. Maine (7-3, 6-1 in the CAA) can clinch the CAA championship and the league’s automatic bid to the NCAA playoffs with a home win Saturday against Elon, which is ranked 14th and 12th in the two national FCS polls. Maine, ranked 16th and 19th, last won the CAA title in 2013. The Phoenix (6-3, 4-2) need a win to guarantee a playoff berth. “There’s a lot on the line for both teams,” said Ferguson. Maine could lose and still clinch the automatic bid through the CAA tiebreakers. But the Black Bears would rather win the title outright.